The approach of Valentine’s Day finds us winter weary. Looking for something decadent, magical, a treat for all seasons, most people will choose chocolate. Once only food for emperors and kings, over 400 years ago Spanish explorers wrested cacao from the Aztecs in Mexico where it had been an aphrodisiac and power building drink. Native to Mesoamerica the cacao tree and chocolate remnants have been found in settlements dating back almost 2000 years before the Common Era (AD). Once bitter and used medicinally, the accidental addition of sugar allowed chocolate to steal the hearts of western Europe. Industrialization spirialed cacao from Hershey’s to Valrhona. Chocolate’s now in everyone’s reach in almost every supermarket or drugstore from Cadbury’s Dairy Milk to Lindt Excellence. Chocolate always tops a dessert list, and everyone’s delighted with a glass of classic French Chocolate Mousse. Sounds fancy but it’s really easy. 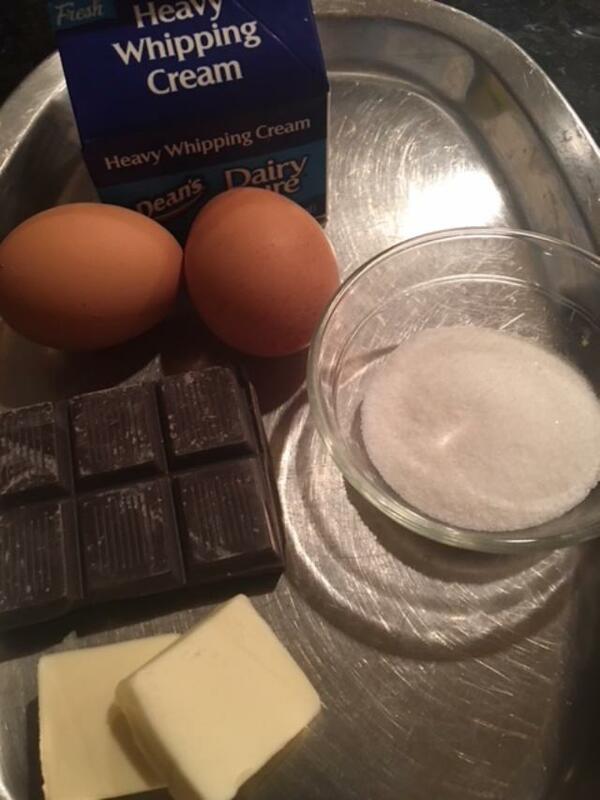 To make a classic chocolate mousse, all you need are eggs, good chocolate, a little butter and a touch of sugar. I like a bit of whipped cream in the mix, but it’s not necessary. Two years ago Judy gave me the most beautiful French pastry recipe book and tucked in these gilded pages, I found a foolproof method for chocolate mousse that removes the age-old problem—siezed chocolate. This happens with melted chocolate combines with liquid, egg yolk, cream or liqueur and suddenly stiffens. The chocolate meant to be creamy then clumps. Additions of whipped egg white or cream then deflate as one mixes even more to break up the lumps. The result will still be tasty but will lack the fluffy lightness that something mousseux is all about. 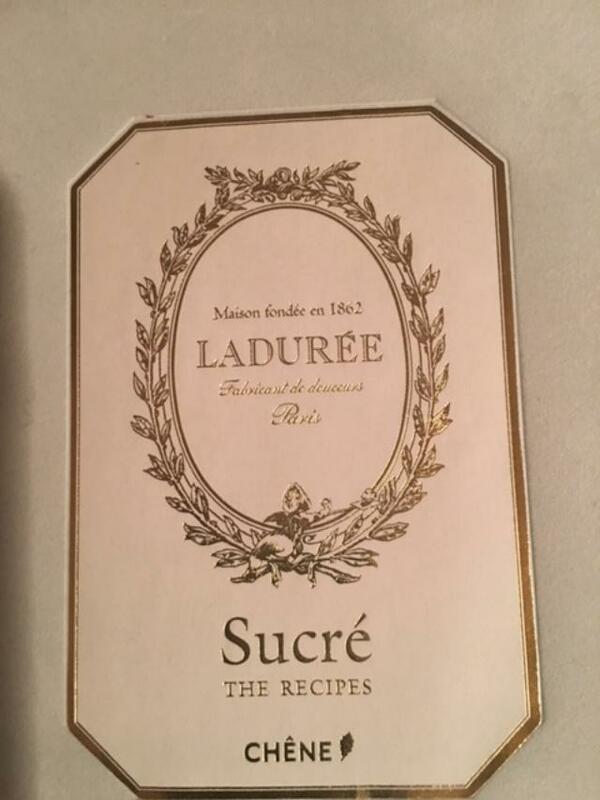 When I discovered the La Sucre technique, I was free from any mousse angst and found I could easily pull this dessert together in 10 minutes—no sweat. A few pointers: Use good chocolate. Mousse is no place for chocolate chips or a cheap candy bar. If possible find a European style chocolate that’s ultra smooth (Surprisingly Trader Joe’s has excellent Belgium chocolate at bargain prices.) Chocolate melts best over low heat. (Hold a square in a tight fist and see how quickly it softens.) 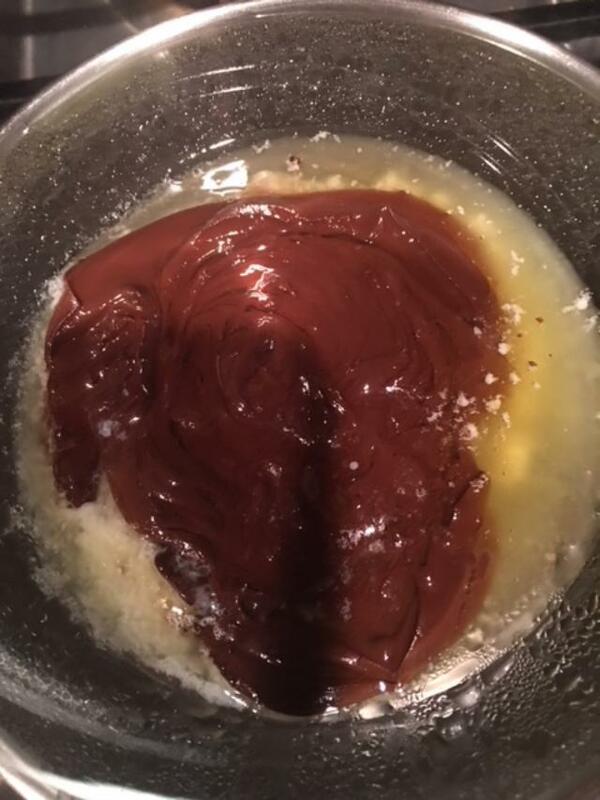 For optimal melting, place chocolate and butter in a glass bowl (Pyrex) set over a saucepan of barely simmering water. Keep an eye on the water to make sure it never really boils or the chocolate will get too hot for an even melt. 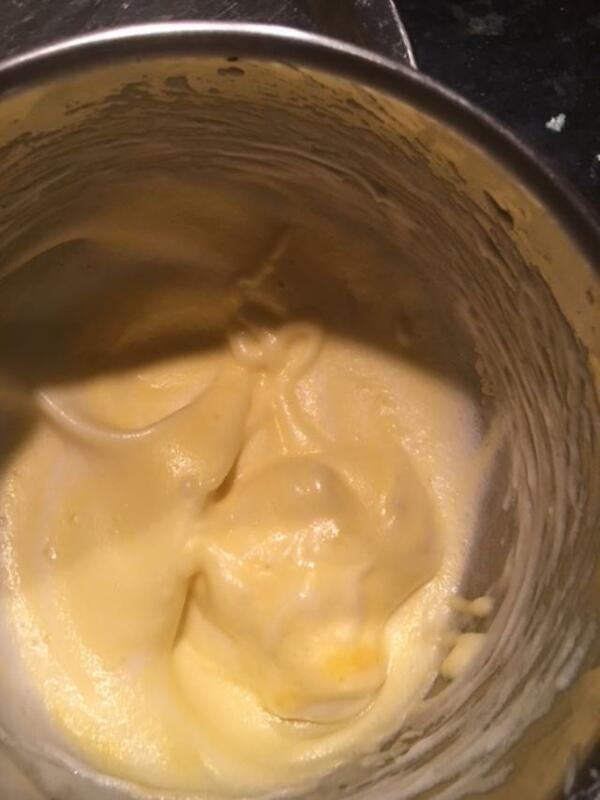 Thirdly, the classic mousse is made with raw eggs, so choose free range, farm fresh or organic eggs and rinse the eggs carefully before cracking to separate. Raw eggs are safe; just be careful where they come from. You can go for pasteurized if you must; I never have. An infected egg will look bad and smell bad. Use your common sense and remember that cooks have made fresh mayonnaise and chocolate mousse with raw eggs for generations. You’ll find this recipe so simple, you’ll want to keep it a secret. Here’s everyone’s fave for Valentine’s Day. simmering water. Allow the chocolate to melt slowly. Remove from the heat and gently combine the melted chocolate and melted butter with the tines of a fork. satiny meringue. Add the yolks to the meringue and stir gently together with the whisk. Use a rubber spatula to fold 1/3 of the egg mass into the melted chocolate which should now be slightly cooled. 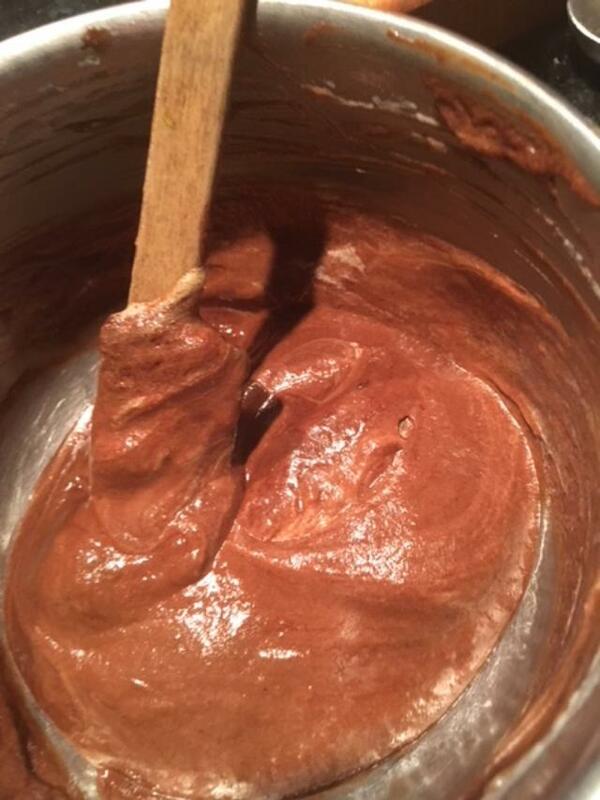 Then scrape the lightened chocolate mixture over the remainder of the egg mix and fold together. At this point fold in two rounded large spoonfuls of whipped cream if desired (checking first with your clean pinkie finger to make sure that the mousse does not feel warm which would melt the cream). 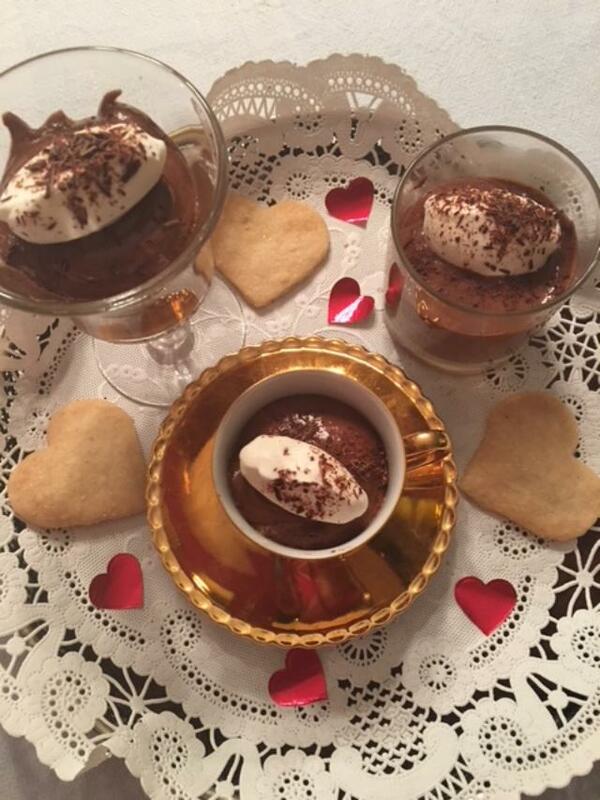 Once the mousse is ready, spoon it into small serving glasses (juice glasses, wine glasses, demitasse coffee cups or custard cups) or scrape it into a glass bowl. Decorate the top with quenelle blobs of soft whipped cream and decorate with chocolate shavings (use a swivel blade potato peeler along the edge of a chocolate bar). Cover with plastic wrap and chill at least an hour or two to allow the mousse to firm up. Serves 4-6. You are currently browsing the Mary Jo's Kitchen blog archives for February, 2018.